Type 1 Diabetes after 55 - Nick Melhuish: Can you believe why Calvary Hospital is the second most expensive in Australia? Can you believe why Calvary Hospital is the second most expensive in Australia? Can you believe why Calvary Hospital is the second most expensive hospital in Australia? According to the Health Minister "Specialist services, such as open-heart surgery, some complex brain surgery, bone marrow transplantation, and some high-level care for babies offered in the ACT do not have the same economies of scale possible in larger jurisdictions." Calvary does NOT do open-heart surgery, complex brain surgery, bone marrow transplants, or have a high-level neonatal ICU. How can a politician get away with such a statement? Because voters let him. 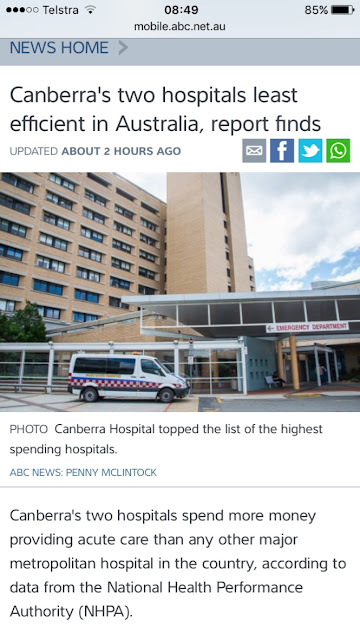 Canberra people get the politicians they deserve, and the health system, and the funding cuts in other areas to pay for ACT Health incompetence. And if you think expensive health care means good service look at the KPIs of the clipboard army. Of course, none of this will be any surprise if you have read my previous blog posts. And if you think all that money means state-of-the-art equipment look at what happened when a surgeon repeatedly complained that the operating theatre was too hot, and the manager kept saying it was fine. Eventually, the manager brought along their thermometer to show the surgeon they were wrong. After procuring a polystyrene cup, water and ice from the tea room, the thermometer was found to read minus 4.6 degrees C in ice water. Theatre temperature was then adjusted to what it should have been. Battle won. War goes on.